Toady munching on a delicious carrot. When grocery shopping, Manbeast and I always grab extra bananas, cucumbers, carrots, and tomatoes. This isn’t because we just can’t get enough fruits and veggies, it’s because instead of traditional dog treats, we feed our pups fresh produce. This causes our guests to constantly exclaim: “Your dogs will eat that?! I thought that dogs only ate meat!”. Nope. Dogs eat fruits, veggies, meat, underwear, dirt, cat poop, dead things, cat hairballs, walls…they actually have fairly diverse diets. However, since I don’t want to feed my dogs underwear and cat poop, I have opted to feed them healthy, actual food for snacks instead of garbage treats. Don’t get me wrong, there are plenty of healthy dog treats out there if you look hard enough, but they cost a good hand of change and when you have big dogs, tiny healthy treats don’t go very far. It’s much easier to split a banana between them. Cheaper and healthier, too. They don’t appreciate all of nature’s bounty, though. Mylo absolutely refuses to eat celery, while Toady spits out broccoli on the floor like a small child who just tried it for the first time. Other than that, they’ll eat just about whatever we give to them. I’ve heard that some dogs will not permit a vegetable to come near them, but luckily mine don’t have that aversion. Since Manbeast and I try to eat healthy, it’s only natural that we would try to boost our dogs diets with healthier treats. Many manufactured dog treats contain high fat, lots of various grains (cornmeal, flour, cornstarch, chicken meal, etc.) so you have to regulate how much they can eat so that you don’t cause negative health issues such as obesity, skin conditions, and so on. With produce, I can give them as much as I please without worrying about “over-treating” them. Do your research though, some garden goods can be harmful to dogs, so make sure to look before you go too crazy. I prefer to stick with the fresh stuff instead of feeding them garbage treats, and cat poop just makes their breath so terrible. Our dogs are not on vegetarian diets. We only substitute treats with carrots and such. They still eat two meals of Acana Pacifica every day. Do you feed your dogs (or cats) veggies? What are their favorites? Have you ever surprised anyone by feeding your pets produce? Yay you! We are a veggie and fruit family also! The boys get carrots, apples, blueberries and all kinds of veggies. I also make them frozen Kongs with mashed up banana. Just this weekend I read that garbanzo beans are good for dogs so I’ll be trying those also! We do the banana/Kong thing too! They love them. High five to you! We adore fruit and veggie families! 🙂 I’ll have to try the garbanzo beans. Oh, mine love apples too! It does make eating them yourself difficult though, haha. I haven’t tried green beans on mine yet, but I will have to sometime! Moses and Alma have both had their fair share of fruits and veggies – both are fans of carrots, make a mess with but seem to like celery, but have a similar reaction as yours to broccoli. Actually what went over surprisingly well: fresh pineapple! I had no idea – they both loved it. Oh, ours love pineapple too! I love getting them to try new things—their expressions are priceless! 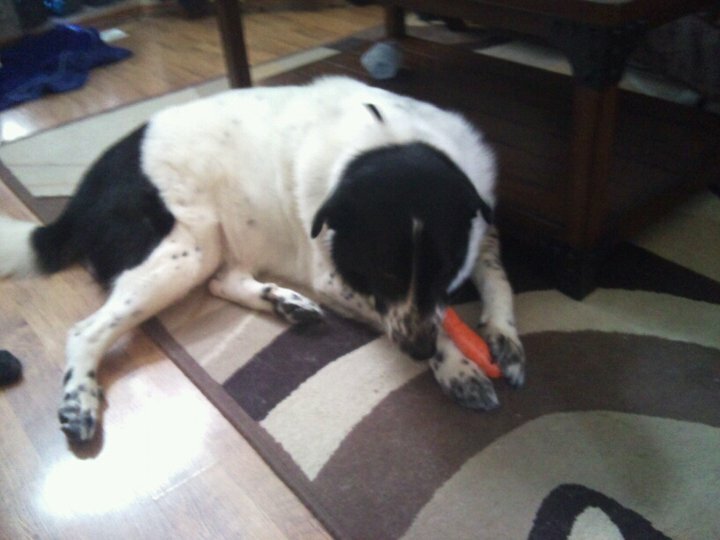 Dottie loves carrots and Boomer will take one every now and then but it’s not his favorite thing. This morning I thought I would see what they thought of a banana and both of them spit it out! I couldn’t believe it, they may be the first dogs I’ve met that don’t like bananas! That’s funny, ours love bananas to the point that they know the word for it now and come running, haha. That’s a great idea for a game! We play raspberry toss at our house because we have a ton of raspberry bushes. The dogs love it, they get to be extra active, and I don’t have to worry about the berries going to waste! Carrots broken in half were the standard treat for Dudley and Zoe. The crunch is good for their teeth and they loved them. Much healthier than “dog treats”. Dudley’s poop was orange he ate so many carrots. I do miss my babies! Beware of the grape . . . green grapes especially, but I think grapes are bad for all dogs. Yes, we always avoid grapes of any color. Apples are good for their teeth too, and they love them! Thanks! 🙂 Mine love bananas and apples the best. Sometimes we give them pineapple and mango, but in small doses. Let me know how it goes with Chancy and fruit! Love this because it is so true! I think dogs are like children in more ways than we know… if we overfeed them and offer them treats that are unhealthy, of course they won’t have an appetite for the things that are good for them! Exactly! And why not feed them healthy food if they enjoy it? I would get sick of dry food if I had to eat if everyday. Ours won’t eat their veggies unless they are puree’d into their homemade dog food. Papaya and pineapple on the other hand – they can’t get enough! Oh, the things we do for our dogs! I’m glad mine love them plain! I’ll have to try papaya on them, I don’t think they’ve ever had it. Papaya and Pineapple have enzymes that help break down protiens, even the ones dogs have a hard time digesting. Ours went immediately to the papaya. It took a little longer with the pineapple, but they love it now.